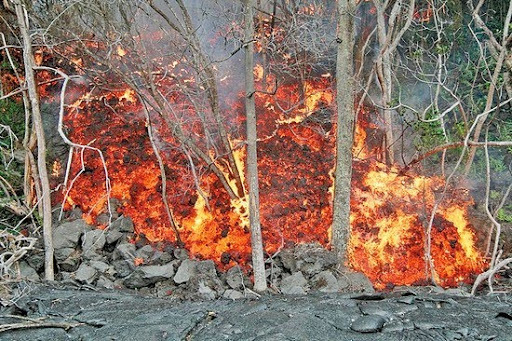 Lava oozing from Kilauea Volcano forced the evacuation of a Kalapana couple and their dogs yesterday and closed within 100 yards of their house — one day after the flow crossed the Big Island's Kalapana access road and enveloped the intersection of Highways 130 and 137, sending up a plume of thick, black smoke. Star-Advertiser. An unusual 3.5-magnitude earthquake shook homes around Oahu yesterday, capping a wild weekend of seismic activity around the Pacific. Star-Advertiser. Abercrombie-Hannemann rivalry promises primary-race pyrotechnics. Associated Press. To some, the love shown by Mufi Hannemann, Neil Abercrombie and other politicians to the Hawaii Carpenters Union on Saturday may have resembled pandering. Civil Beat. Honolulu mayor Mufi Hannemann has clarified his position on the Civil Unions Bill. KHON2. Just as Hawaii's recession-weary economy is turning the corner on rising unemployment, the state's jobless have been dealt another setback. Star-Advertiser. The fight to keep wind turbines off Hawaiian homestead lands on Molokai continued on Sunday as homesteaders sought assurance from the Department of Hawaiian Home Land (DHHL) that wind farms would not be built at Mo`omomi and Anahaki in central west Molokai. Molokai Dispatch. Mayor Billy Kenoi claims Hawaii County departments are spending 35 percent less than when he took office, but a Tribune-Herald analysis shows otherwise. Tribune-Herald. The Kaua‘i County Council years ago approved funding to drastically improve Internet accessibility to county meetings and public documents, including posting the minutes, agendas and bills. But it wasn’t until Wednesday that a resolution was introduced to finally establish concrete policies. Garden Island. A record number 64 medical students were donned with white coats and stethoscopes during a welcoming ceremony at the Hilton Hawaiian Village. It's the UH School Medicines Class of 2014. Hawaii News Now. Many think Manhattan is the most expensive place in America, but according to a survey done by the commercial real estate firm Colliers it costs nearly $2 more to park in Honolulu for a day than in midtown Manhattan. KITV. Despite bankruptcy, a group from the Honolulu Symphony continues to play. KHON2. A plan calling for 1,500 homes in a new Olowalu town has had its ardent supporters and equally passionate detractors for five years, and so far the proposed development has won support from the General Plan Advisory Committee and the Maui Planning Commission. Maui News. A Koloa-based company which has been bottling spring water from Kahili Mountain since 2003 may be forced to close its doors unless an appeal against the company is lifted, said Kaua‘i Springs owner Jim Satterfield. Garden Island. A new (and very old) agricultural technique is getting lots of attention these days. West Hawaii Today.